but without mashing the crab meat to much. Heat a skillet with 2 tbsp of oil over medium heat. 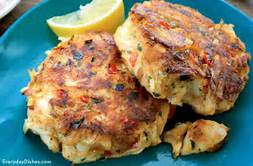 With your hands make patties aprox 4" in diameter and 3/4" thick. Place patties in pan (may only be able to fit 3 or 4 depending on the size of your skillet). Cook for 5 minutes or until edges start to brown, flip and cook other side. When serving squeeze some lemon juice over the top and sprinkle with a pinch of salt. If you are cooking in batches then I suggest putting in 1-2 tbsp of oil as you might need to add more oil to cook as the crab cake will soak in some.